Island Park Reservoir, Grassy Lake and Henrys Lake have all filled. 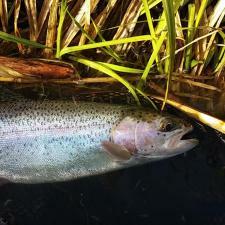 Natural streamflow in the watershed is around 9,500 cfs and at its final peak for the season. Total watershed-wide irrigation diversion is around 3,000 cfs, right at average for this time of year. Outflow from Island Park Reservoir is being set to keep the reservoir full. Only small changes are anticipated over the next week, and outflows should remain around 950 cfs plus or minus 150 cfs, depending on rain. Delivery of water from Island Park Reservoir in excess of inflow is not expected to be needed until early July. 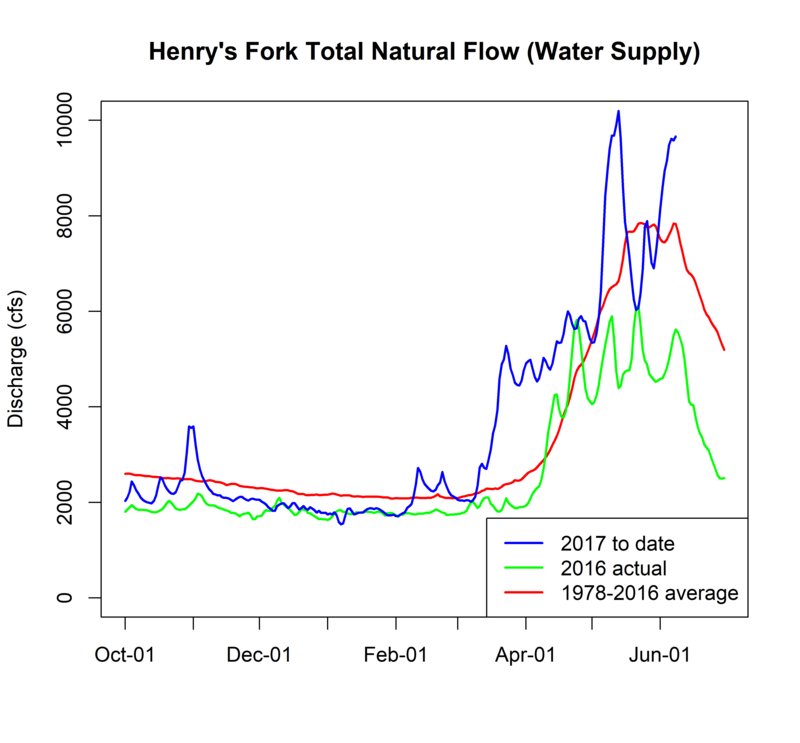 The graphic below shows total Henry’s Fork watershed surface-water supply, which is combined natural streamflow in Henry’s Fork at Ashton, Fall River at Chester, and Teton River upstream of the Crosscut Canal. Natural streamflow is essentially the water that would be in these streams in absence of reservoirs and diversions. It’s easy to see that current supply is better than average by about 20% and is twice that of 2016 at this time. Although the natural streamflow peak we experienced back in May was slightly higher than this week’s peak, all of the watershed’s reservoirs are full right now, whereas they were still being filled in May. So, we now have full reservoirs plus 9,500 cfs of natural streamflow. 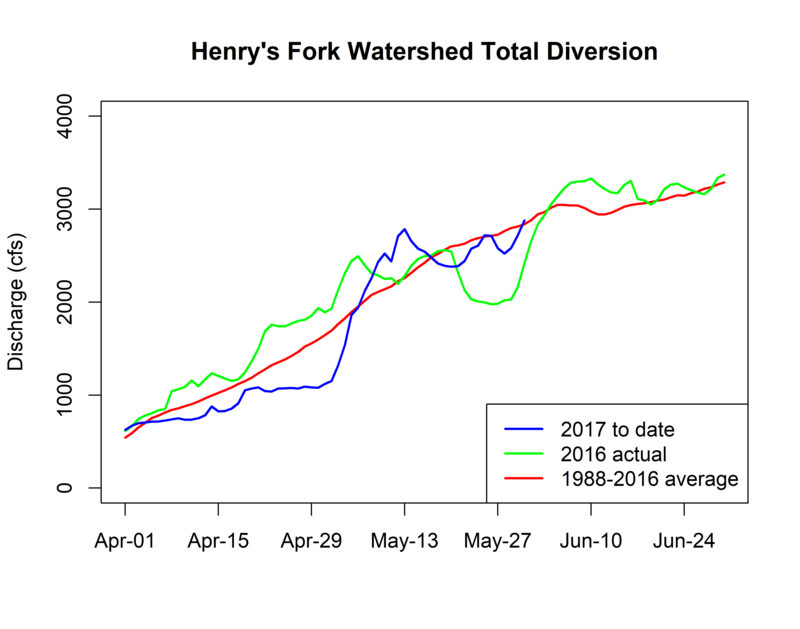 The graph below shows total diversion from the mainstem Henry’s Fork, Fall River, and Teton River downstream of Crosscut Canal. Diversion was below average during cool weather in late April, but recent warm weather has increased diversion to average rates. Current diversion is around 3,000 cfs and will gradually increase up to 3,500 cfs, which is close to the typical irrigation-season maximum. Total diversion right now is not much different than it was in 2016. The big difference is supply. 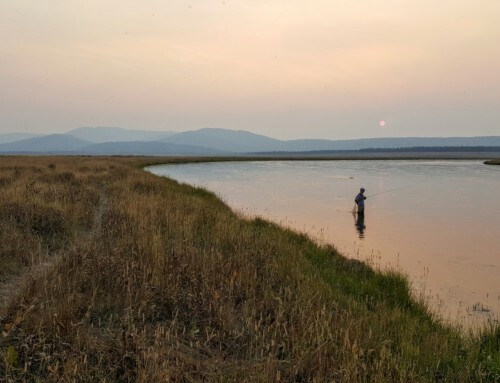 Last year at this time, supply was around 4,500 cfs, with diversion of around 3,300 cfs, leaving only a slightly more than the low-flow target of 1,000 cfs left in the river at St. Anthony. Island Park Reservoir was already being drafted slightly at this time last year. 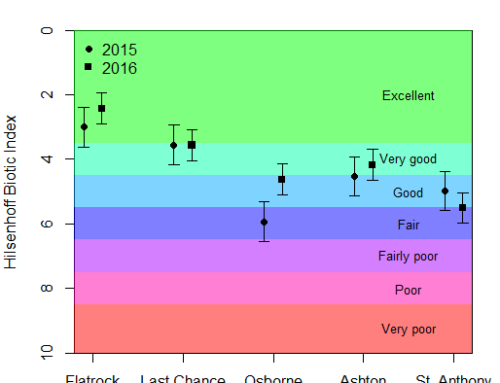 The graph below clearly shows how much more water is in the river at St. Anthony than last year. 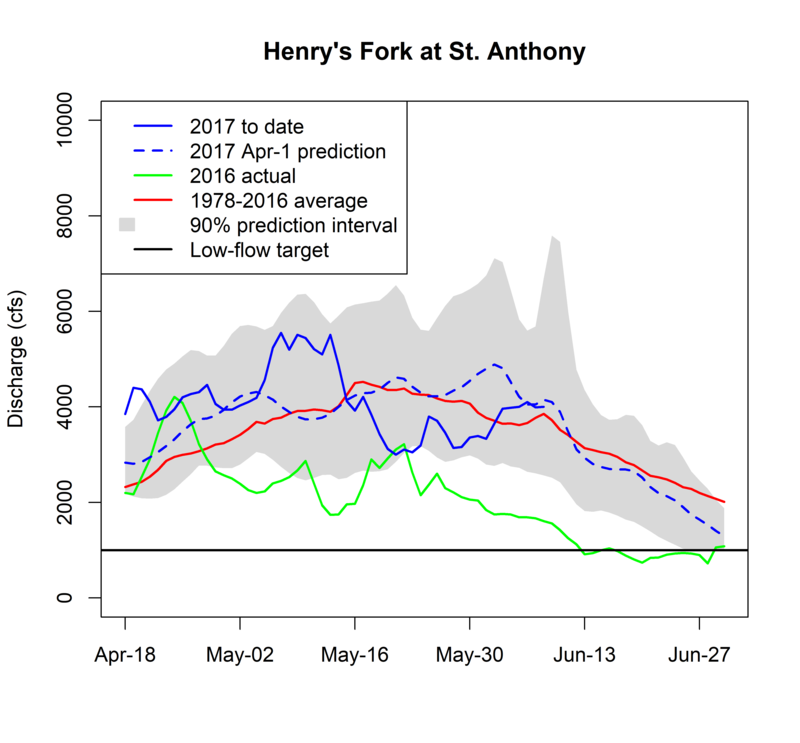 Flow at St. Anthony currently agrees very closely with the predictions I made back in April (see prediction blog). Given current snowpack, reservoir volume, diversion, and weather conditions, I anticipate that the model will continue to predict conditions well over the next few weeks. In particular, streamflow at St. Anthony will remain above 1,000 cfs for several more weeks. 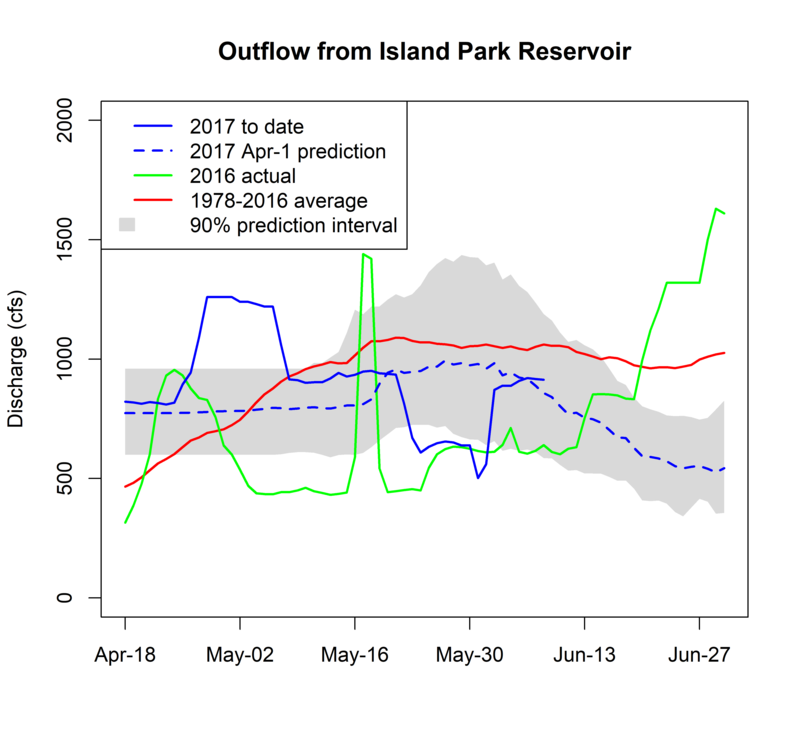 The final graph shows outflow from Island Park Reservoir, which today, is below the long-term mean, well above last year’s value, and very close to my April-1 prediction. The major discrepancies between my April-1 prediction and 2017 actual outflow are: 1) higher-than-expected outflow for 10 days in late April and early May, and 2) lower-than-expected outflow for 10 days in late May. These two deviations exactly offset each other in volume. The high release was made to create a little extra space in the reservoir during the very wet period at the end of April in case very warm weather or a large rain event suddenly delivered a large amount of late April’s increasing snowpack into the reservoir. Refilling that small amount of extra space required an outflow reduction in late May. After allowing for the offset in volumes during these two time periods, total volume of outflow over the past six weeks has been remarkably close to my predicted value, continuing to provide confidence in use of the predictive model to anticipate conditions over the next few weeks. 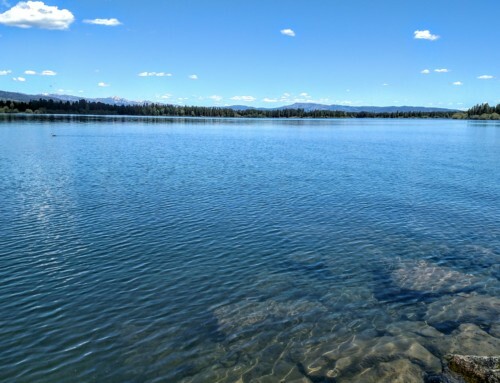 With snowpack gone now, the reservoir can be managed with much tighter precision to keep it full from now until release to meet irrigation demand is needed. The April-1 prediction provides a very good estimate of outflow over the remainder of the month—generally decreasing from its current value down to something around 500-700 cfs by the end of the month, subject to uncertainties such as next week’s forecast rain. At this point, 850 cfs is our estimate of outflow from Island Park Dam for the Harriman State Park fishing opener on June 15, but it could be a little higher if we get a large amount of rain next Monday and Tuesday. In any case, outflow adjustments over the next week are expected to be small–100-150 cfs one way or the other.